Rip It Energy Shot is from the makers of discount, Rip It Energy Drinks. 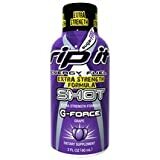 In 2013 Rip It Energy Shot was the 8th highest selling energy shot in the USA thanks partly to their deal with Walmart stores and their more affordable price. Rip It Energy Shot has less caffeine than popular 5 Hour Energy Shot. See our review of this shot here. Rip It Energy Shot contains 50.00 mgs of caffeine per fluid ounce (169.07mg/100 ml).